The Mega Man universe is populated with a plethora of characters who've never quite been immortalized in plastic; toys, actions figures and the like. 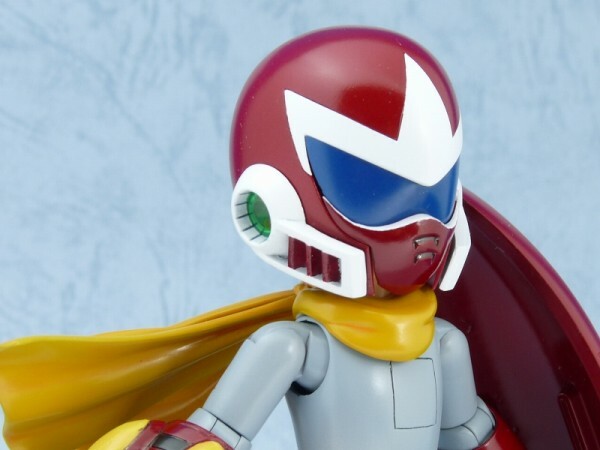 Break Man is one such character and like his alter ego, Proto Man, has a devoted and creative fanbase: what do you do when they don't make a Break Man model kit? You make one! 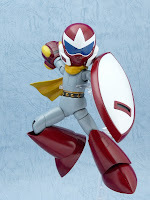 This custom Break Man (Hitoshi Ariga style) is the product of reader Jin, a crafty fan who spends his free time modifying and customizing Kotobukiya Rockman model kits to his liking. 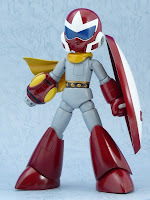 Would you believe most of the materials used to turn this ordinary Proto Man model into Break Man were handmade? Good stuff. With Break Man completed, Jin is open to requests fro future Kotobukiya customizations. 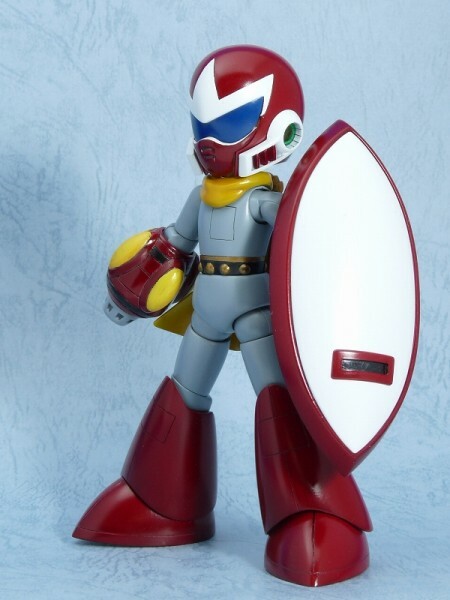 He's willing to try anything, but ensure the character can adhere to the "frame" of either Proto Man, Mega Man, or Roll, the currently available Kotobukiya models. Drop your requests in the comments! UPDATE: I'm sad to report that Break Man here was not created by Jin, but Nagano Ken. Jin (who is unrelated to the famed Jin Saotome) wrongly claimed Break Man as his own creation, and apologizes for any inconvenience this may have caused. Damn, that's pretty friggin' awesome! I was gonna do this when the kits came to the USA! Are most of the Rockman parts interchangeable? If so, he could make an unholy monster made of X's head, Zero's Helmet/Hair, Roll's torso/dress, Zero's Sword, Protoman's Buster, Megaman's Left Leg and Breakman's right leg. Why is his shield upside down? Would Kalinka be possible I wonder? @Zan It's down. When he brings is arm up it will be right-side-up. I've seen scans of Gigamix, where even with his arm down,the shield is still the right way up. @Zan It's possible that it's that way in the manga because it looks better, but you can't do that sort of thing in real life without some complicated mechanical parts or breaking physics.